Dzierżoniów is a comparatively large town, 40km east of Wałbrzych, so nobody should have any problems with its finding. 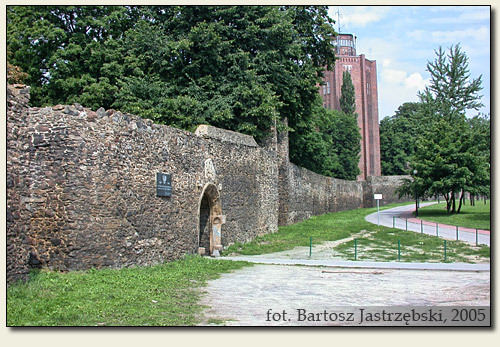 Probably in the area of Dzierżoniów two castles existed in the past – the ducal one, and the second of commune head. Unfortunately the remnants of none of them did not survived up to this day and their history is practically unlearned. The historical sources tell about two names of defensive structures in Dzierżoniów: Hummelschloss and Klinkenhaus. It is nothing more known about the first one, so it is assumed that if it had existed it would have stood within town walls. The other castle, the ducal one, probably stood at the place of present church of Panna Maria from 1798. It is however an assumption drawn on the basis of information linked with the construction of the church, during which the relicts of some castle were dismantled. If it had been the Klinkenhaus castle, it would have been built by the duke Bolko I of Świdnica-Jawor in the second half of the XIIIth cent. It is possible however that the constructors of the castle were the dukes of Wrocław who were the owners of these lands till 1291. Because the print presenting the town in the middle of the XVIIIth cent. does not contain any traces of the castle, it is assumed that it was demolished during the Thirty Years’ War.